for what are you wating the most? 1. which one is your favorite? i am very excited to see the 747 V2. For me it's the T7. I'm looking forward to the 747 but the current one although old now is still a great aircraft that I can enjoy flying and no great T7 exists. BTW IMHO the T7 is a much better looking jet than the 744. Really, IMHO, the 744 is bloody ugly. I disagree, it's the most beautiful plane at the skies. Why can't I vote for both PMDG's? I have some love for that plane! In real world the 777 is my favorite, it is the ultimate aircraft in term of design, size, range and system, followed by the a 320 , luckily (hopefully) they will be released in the same order. The 747v2 will have a place in my hangar as well, so no worries here. On the other hand, IMHO, the 767 and especially the 777 are beautiful aircraft. well i better like the look of the 777 an no it´s not because it´s the latest graffic quality. 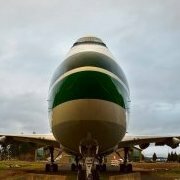 But i better like a mashine whit only 2 ENG and then the 747 have never been my favor plane i got it but never said much to me mabe why i only flew it a few times... i dont know but 747 as well as A340, A380 never said me much they are just to big.. I'm surprised no one has mentioned the Enigma Sim 737. Earth Simulations Isle of Man. :lol: Yeah, obviously, true, correct, you are in a critical level luke, I know your medical condition, consult dr. RSR he has some medicines for your particular case. Not excited for either as I like short haul hops around Europe! The T7 will be nice but PFPX will work with ALL of my planes. I want it first and foremost.